Shuttle Inc. announced its new product – Shuttle XPC Barebone SG33G5M. It’s a small form factor PC with stylish design and impressive functionality. The SG33G5M supports processors of Intel’s Core™ 2 Quad, Core™ 2 Duo E6000/E4000 series, Pentium Dual-Core E2000 series and Celeron 400 series and can accomodate up to 4GB of DDR2-800 memory in dual-channel mode. It can play HD video (thanks to GMA 3100 onboard graphics engine and HDMI output) and allows playback of copy protected HD content through HDCP. The sound should be hight quality with built-in 7.1 HD audio chip with Dolby Digital Live! and DTS Connect certification. The integrated Gigabit-LAN connector is well-suited for data streaming in the local network or fast downloads from the internet. 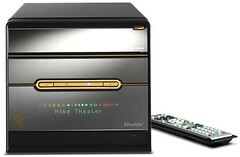 The remote control for Windows Vista Home Premium/Ultimate and the integrated VFD display complete the HTPC view. The Shuttle Barebone originally produced for Windows but you can install Linux based media center as well (MythTV for example). The remote control sensor is compatible with lirc_mceusb2 and the Linux driver for VFD display is also available. You might be interesting to see the Python script to communicate with VFD display because MythTV doesn’t support it directly. The Shuttle XPC Barebone SG33G5M will be available shortly with recommended retail price is €328.00. Personally, I prefer Mac Mini form factor or something similar to Silverstone LC16M. The Shuttle looks a bit heavy for me. But its VFD display is really cool! I like it.